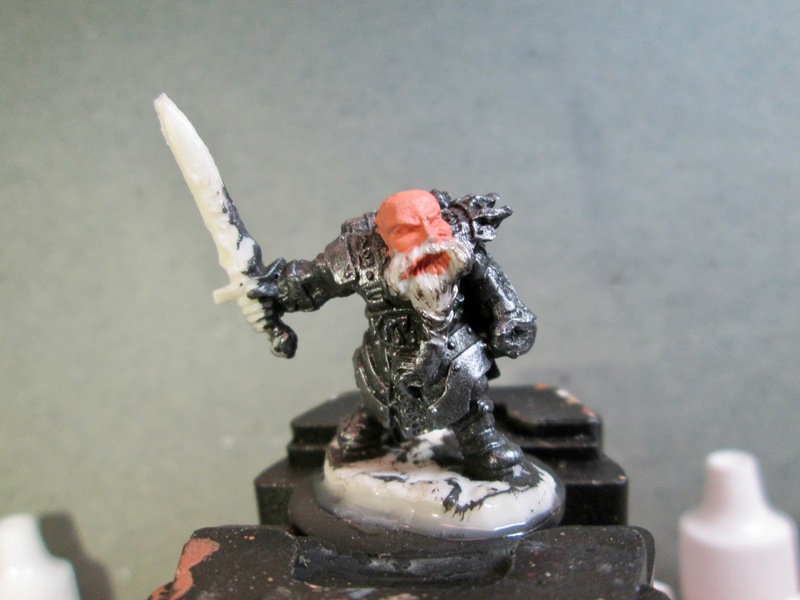 Durgam Deepmug, Dwarf Hero: Bones 3 Figure, Converted to Frostgrave Thug | H.A.W.K.S. 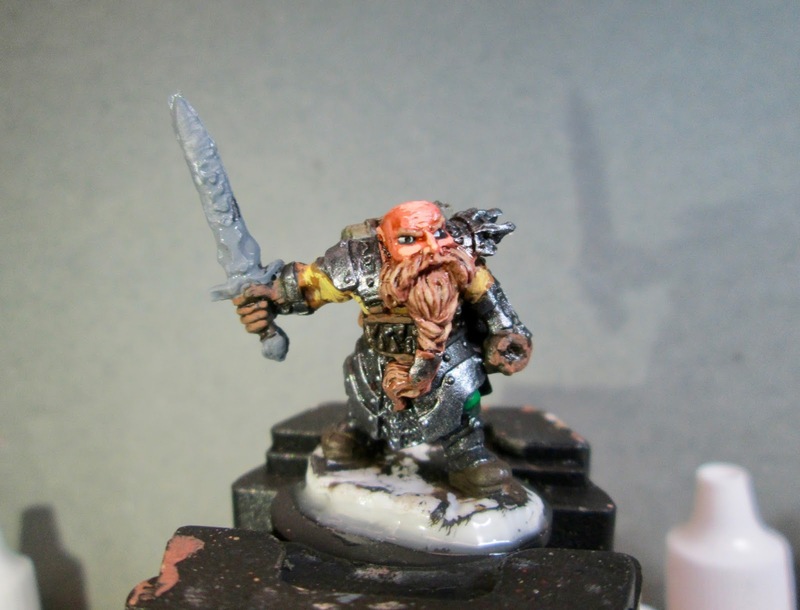 This past week, I painted the Durgam Deepmug figure from the Bones 3 Dwarves set. 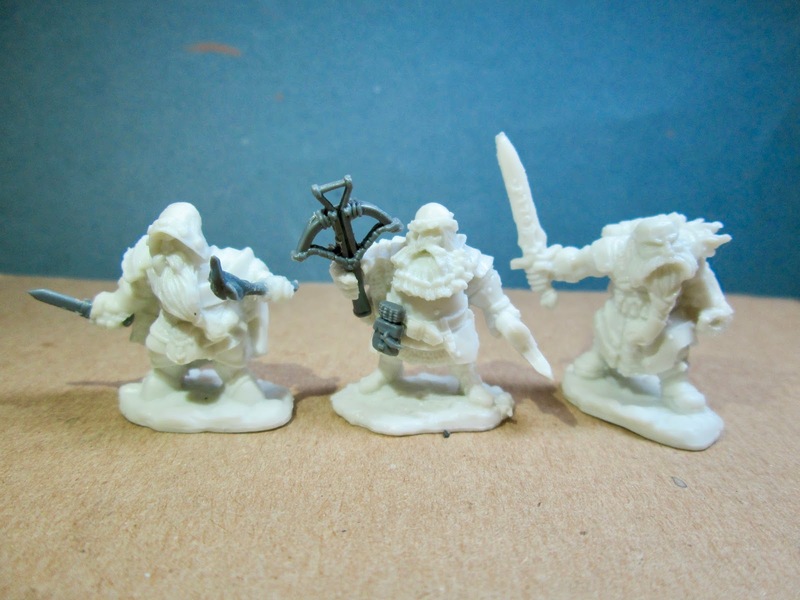 A while back I had converted three of the figures from this set to fill out an all-Dwarf warband I was making for Frostgrave. This is the third and final of the three conversions I had to complete. 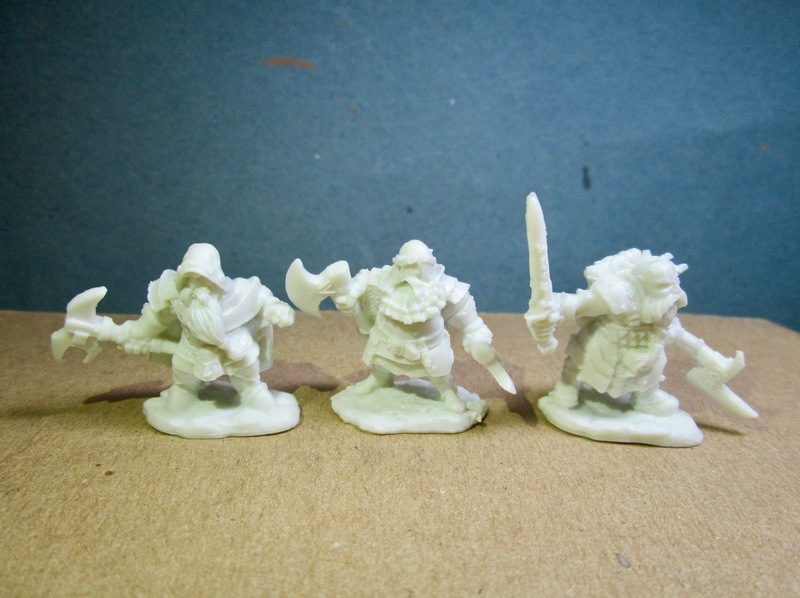 The other two, can be seen here: Hagar, Dwarven Hero, and here: Durok, Dwarf Ranger. Durgam Deepmug is the figure on the far right of the above and below photos. 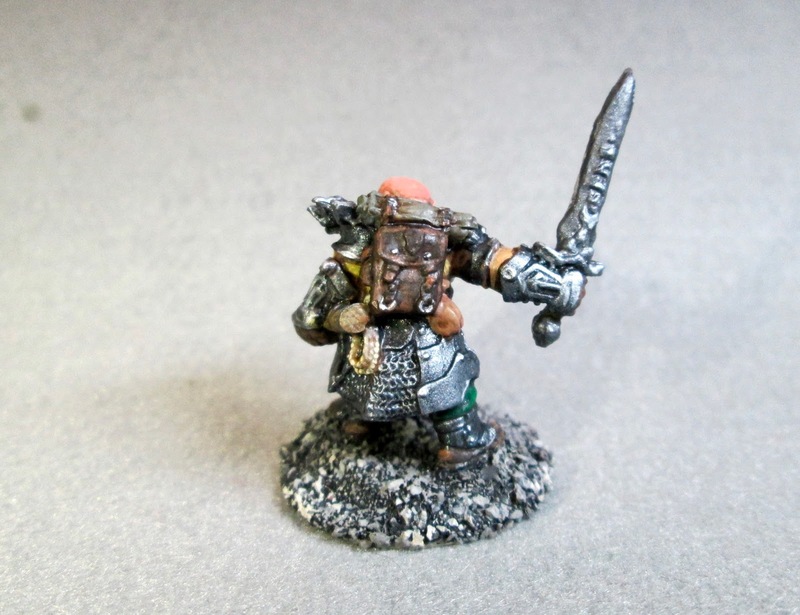 He was a simple conversion; I merely removed the front of the weapon in his left hand, and hallowed out his fist a little to make it look like it was simply clenched. I actually left the back handle end of the weapon, shortening it a little; figuring I would paint it to resemble a map case or such hanging from his belt. I had prepped this figure in the usual way back before I did the conversions; soaking it in a dish of water with a couple drops of dish-soap added, then giving it a light scrub with a soft toothbrush, and then rinsing and drying it. 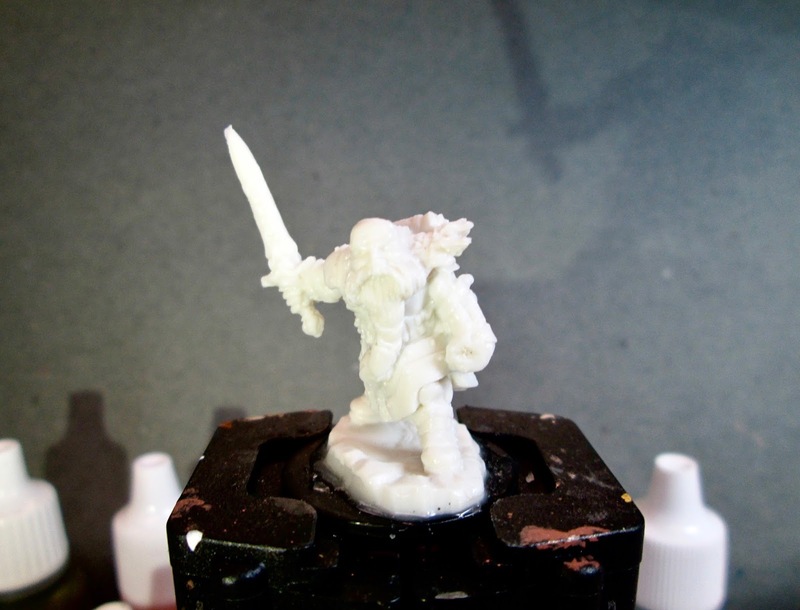 I now glued the figure to a black-primed 1" fender washer with Aleene’s Tacky glue, and then placed the figure in my painting grip. I began by painting all the armor Black. Then, when the Black was dry, I drybrushed the armor with Folk Art Metallics “Gunmetal Grey”, and then passed over it with a lighter drybrush of Ceramcoat “Metallic Silver”. After that, I painted his face with Americana Shading Flesh. Next, I panted his pants with Accent “Forest Green”, and his shirt with Accent “Mustard Seed”. I then painted his his beard with Folk Art “Teddy Bear Brown”, and his belts and straps with Americana “Bittersweet Chocolate”. While I had the “Bittersweet Chocolate” open, I flipped the figure around and used it to paint his backpack. I also decided to use it for his boots and gauntlets. I then continued working on his back, painting his blanket roll with Folk Art “Dapple Grey”, his sack with Americana “Sable Brown”, the rope with Folk Art “Butter Pecan”, and the “map case” (cut down removed weapon handle) with Aleene’s “Deep Khaki”. 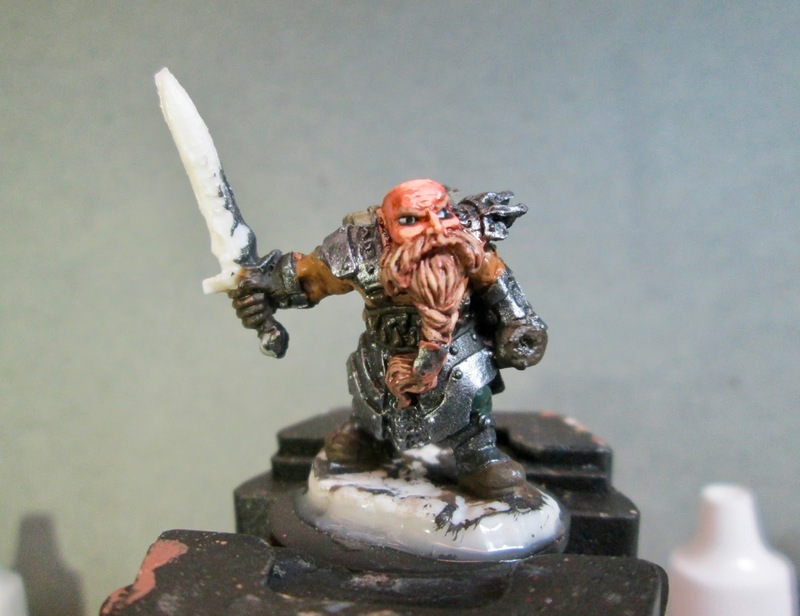 I then gave his face a wash with some Citadel “Reikland Fleshshade” wash. 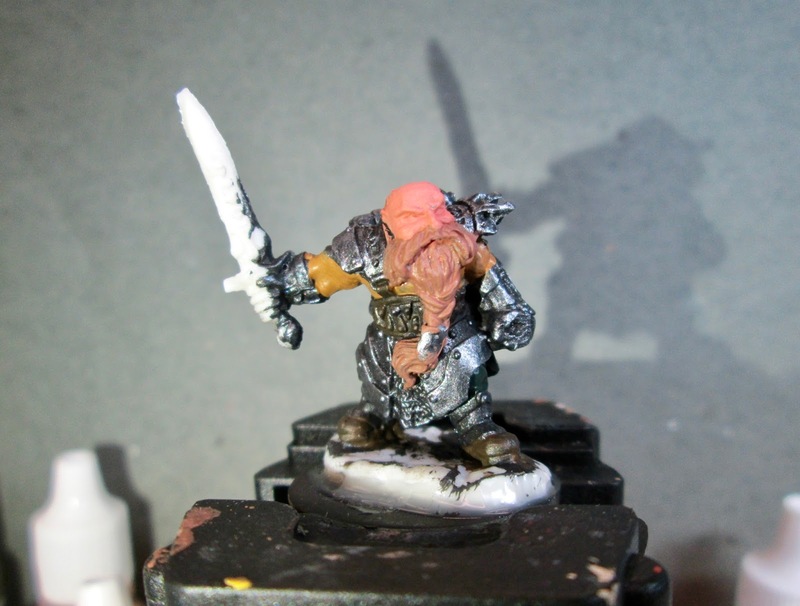 When that was dry, I gave his beard, and everything on him that wasn’t armor, a wash with Citadel Agrax Earthshade"wash. When this wash coat was dry, I painted his eyes, and then highlighted his head with the “Shading Flesh” mixed with some Apple barrel “Apple Flesh”. I then highlighted his beard with the “Sable Brown”. After that, I worked on highlighting his clothing; doing his shirt with Accent “Golden Harvest”, and his pants with Crafter’s Acrylic “Holiday Green”. I then highlighted his belts, straps, backpack, and gauntlets with Crafter’s Edition “Spice Brown”; and painted his sword with Americana “Zinc”. Next, I worked on highlighting the stuff on his back; doing his blanket roll with the base “Dapple Grey”, his sack with Americana “Khaki Tan”, the rope with Americana “Antique White”, and the “map case” with a mix of the base “Deep Khaki” and some Aleene’s “Dusty Khaki”. I next worked on the metal parts, painting the sword and touching up the armor with the"Gunmetal Grey". I also painted his beard ornament with Americana “Bronze”. 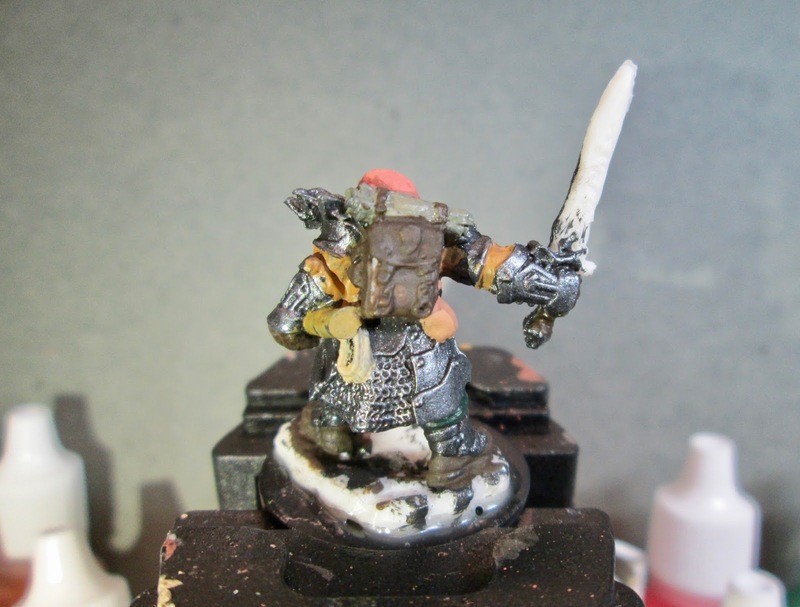 After that, I went back and gave the runes on his sword a wash with Citadel “Nuln Oil” wash. When that wash was dry, I did highlights on the sword and armor with the “Metallic Silver”, and highlights on the beard ornament with some Americana 14K Gold". Well, I’m happy with this guy, though in reality he is a bit over-armored for a Thug. But he’ll do just fine. 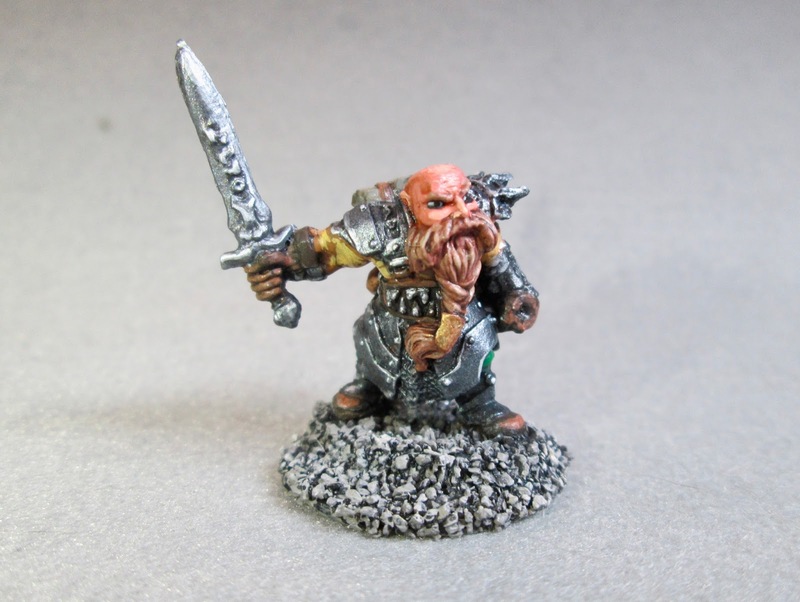 There just aren’t a lot of non-armored Dwarf Warrior figures out there. Very nice looking and “Yay! 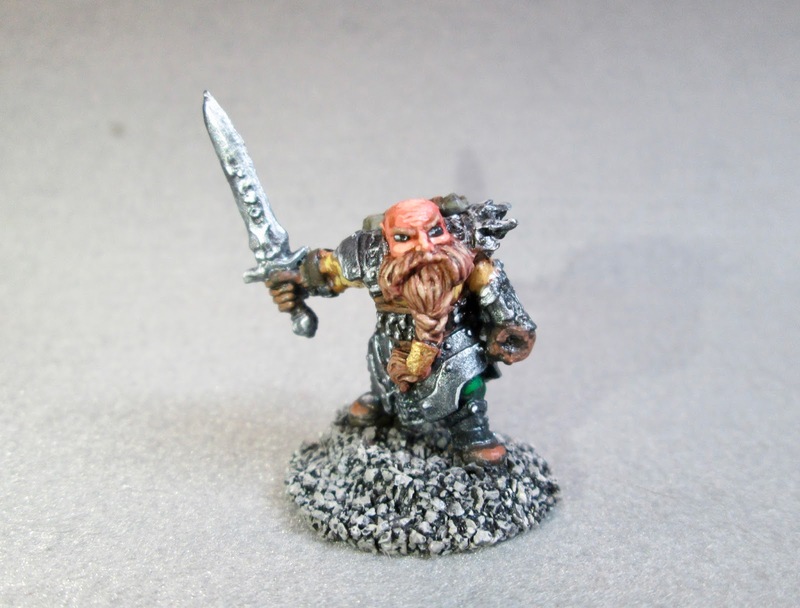 For more Dwarves heroes!”.